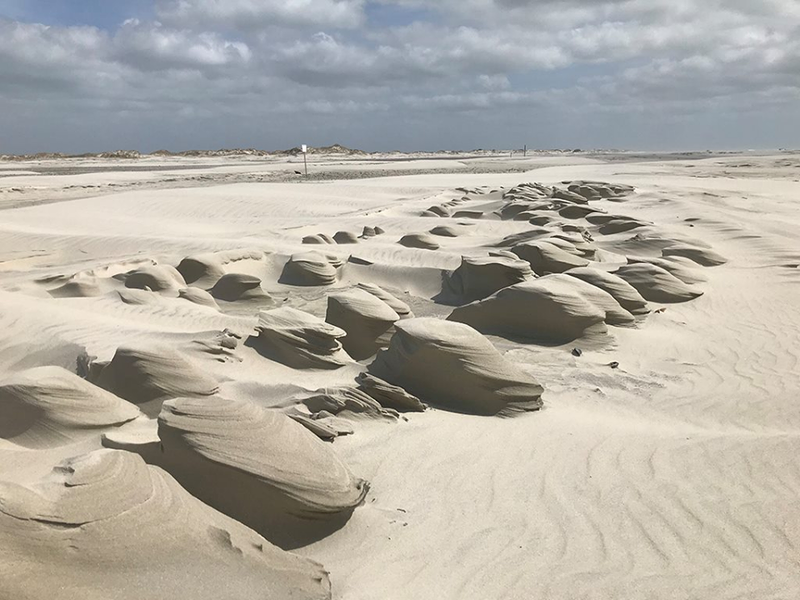 WILMINGTON – Plans are once again on hold for a sand-mining operation on land where a plume of toxic chemicals is migrating below ground from a neighboring industry in Castle Hayne. Hilton Properties Limited Partnership agreed Thursday night to continue its request for a special use permit to mine a little more than 28 acres within a 4,100-acre tract. The New Hanover County Planning Board is to consider during its meeting March 7 Hilton Properties’ modified special use permit application. Following a public hearing, the New Hanover County Planning Board approved 5-1 a request to rezone 63.02 acres from rural agriculture to heavy industrial. Board Vice Chairman Donna Girardot opposed the rezoning request. The area where the owners want to mine sand is in the westernmost portion of the 63 acres, clear from the path a plume of contaminated groundwater is traveling from the neighboring GE Hitachi site, according to monitoring reports. Bill Toole, a Charlotte-based attorney who practices environmental law, said that the contaminated groundwater is migrating about 400 feet every 10 years in a northerly direction on the property. The most recent water sampling report provided by GE, which is required by the state to monitor the plume, showed no uranium above the applicable standards, he said. Sampling showed fluoride and vinyl chloride above applicable standards, but only on GE’s property, he said. He also said that modeling shows contamination would not be drawn toward the area his clients want to mine. Alex Elkan, a Greensboro-based environmental lawyer, pointed out that groundwater samples had not been taken in the proposed mining area. That’s because, according to Toole, samples collected from two sentinel wells GE dug between the proposed mining site and the area of contamination have not detected chemicals. “There’s no reason then to look further over here,” Toole said as he pointed to a map of the property. Homeowners in the Wooden Shoe subdivision, a neighborhood about 1½ miles from where the proposed mining would occur, have for several years expressed concerns about whether mining operations would expose their drinking water wells to the contaminated groundwater. GE disposed of waste from its Castle Hayne facility during the 1970s, the result of which has contaminated groundwater with levels of uranium and vinyl chloride in excess of federal standards. Groundwater contaminant levels were not included in the initial application the property owners submitted to the then-N.C. Department of Environment and Natural Resources, now the Department of Environmental Quality. Neighbors filed a series of three lawsuits after the regulatory agency in 2014 granted Hilton Properties a permit. The lawsuits were eventually dropped. Meanwhile, the state asked the property owners to modify the permit application to include levels of groundwater contamination on the land. The owners ultimately withdrew their 2014 request for a permit from the county. DEQ issued a modified permit Dec. 15, 2017. It expires Feb. 25, 2024. 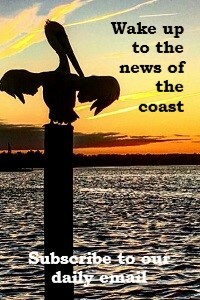 Elkan and Kerri Allen, a coastal advocate with the North Carolina Coastal Federation, said more testing needs to be conducted and information provided to prove the contaminated groundwater will not affect property owner’s wells if mining occurs. 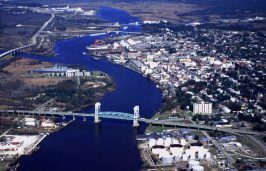 Geologist Roger Shew, a University of North Carolina Wilmington researcher who teaches coastal geology, said it is important additional monitoring wells. He said that water in the lake that will be created once sand is mined should also be monitored. 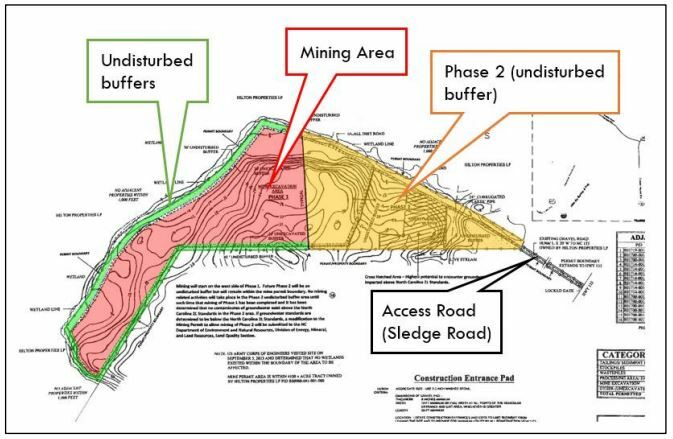 Though the plume was discussed during Thursday’s public hearing, most residents who spoke in opposition emphasized concerns about the projected truck traffic along the gravel road leading to and from the proposed mining site. Susan Murphy’s back yard abuts the gravel road where trucks would make anywhere from 60 to 80 trips each day during mining operations. “When am I supposed to enjoy my back yard?” she asked in front of a packed room in the New Hanover County Government Center in Wilmington. Hilton Properties ultimately agreed to pave a half-mile segment of the road closest to the residential properties and build a vegetative buffer and wooden fence along that same stretch of road. Mining would be conducted 8 a.m.– 5 p.m. Monday through Friday. State permit conditions allow excavation only within the 28 acres. Explosives are not permitted to be used and dewatering is not allowed at the proposed site. “Should there be contamination found on the Hilton Properties site above the applicable standards, mining will cease,” Toole said, reiterating a condition of the state permit. Hilton Properties’ modified special use permit application is to go before the planning board for consideration during its March 7 meeting.